The Magpul Industries ACS Adaptable Carbine Storage Stock is a new design featuring an integral storage compartment built right into the stock. Two water resistant battery storage tubes allow the operator to keep fresh batteries quickly at hand when needed. The friction lock keeps the stock tight and rattle free. A durable rubber buttpad is mounted on the rear for comfort and stability. 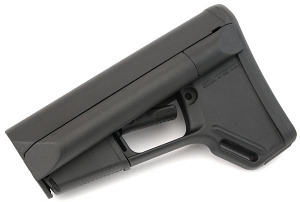 The Magpul ACS is a direct replacement for the Colt M4 collapsible buttstock and other rifles using a commercial size buffer tube. Made in the U.S.A.! As always, Top Gun Supply provides prompt, efficient delivery on a wide variety of items for the gun enthusiast. I have never been disappointed with any Magpul product.